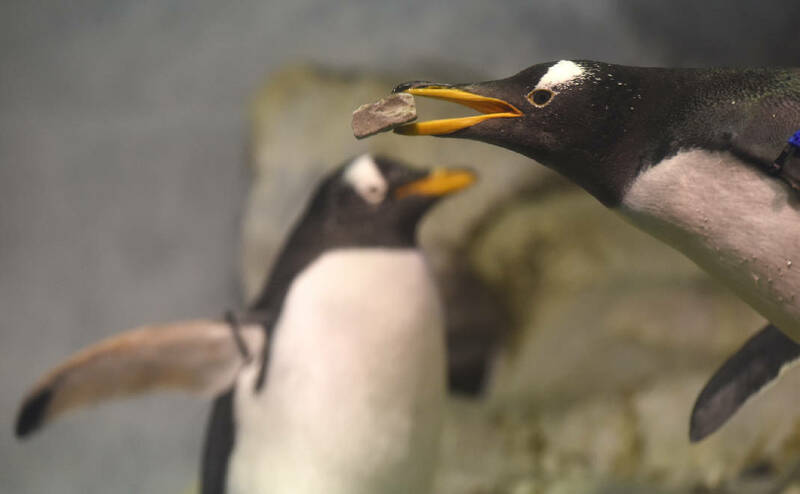 During breeding season, penguins attempt to woo potential mates with the gift of rocks, which — if successful — the pair will use to build their nest. 'Tis the season for agonizing over what to get each person on your list. For inspiration, why not check out the hottest gift trends in the animal kingdom? Species of all sorts partake in the ancient practice of gift-giving. The male firefly, for instance, likes to give potential mates spermatophores, corkscrew-shaped globs of sperm and nutrients for the female to eat. Wild dolphins have been known to present biologists with dead tuna or squid. And the male great grey shrike, an adorable-looking songbird, likes to give females lizards, frogs or mice, which he first impales on a thorn or piece of barbed wire. For more inspiration, we asked animal-keepers from the Chattanooga Zoo, Tennessee Aquarium and Reflection Riding Arboretum and Nature Center to share some of the more interesting gift exchanges they've witnessed over the years. In 2015, BBC Magazine published “The Girl Who Gets Gifts from Birds,” recounting the relationship between an 8-year-old Seattle girl and a flock of crows. As the story went, since 2013, the girl had been diligently feeding the birds. Each morning, she covered a bird-feeder platform with peanuts and sprinkled her backyard with dog food, while the neighborhood crows watched from a nearby telephone line. Sometimes, after the crows had cleared the platform, they would leave behind a present: a button, a paper clip, a Lego piece, a rusty screw. Crows are widely recognized as one of the most intelligent species of bird. But are they gift-givers? “Crows can recognize faces, so they know what humans are good to them,” says Tish Gailmard, director of wildlife for Reflection Riding Arboretum and Nature Center, where she works closely with Oli Kai, the education crow. For this reason, Gailmard says, it is possible a crow would reward a person who regularly offered food. Though, she admits, the more plausible explanation is that the crow was already carrying the object in its beak, which it then dropped at the platform upon stopping for the peanuts. Crows are known tool-users, and have been observed collecting and caching objects that may later be useful. Nipper, the best nest builder at the Tennessee Aquarium, and his former mate Flower tend their clutch. For 11 seasons, Nipper and Flower mated, but last year, Nipper instead chose to mate with a penguin named Pebbles. Nipper, a 13-year-old Gentoo penguin, is the best nest builder at the Tennessee Aquarium. "He's very picky about the rocks he'll use. He has a knack for sturdy nests. When he gets in and out of them, they never fall apart or collapse," says Loribeth Lee, the aquarium's senior aviculturist. On the first Monday of every April, breeding season begins at the aquarium. The staff gives the penguins buckets of rocks, used to build nests, and courtship displays begin at once. Most often, the male attempts to woo the female, laying a carefully selected rock at her webbed feet and then taking a bow. But sometimes, females make the first move, Lee says. Unlike most bird species, Gentoo penguins do not mate for life. Rather, they select a new partner each season — most of the time, anyway. For 11 straight seasons, Nipper chose 16-year-old Flower as his mate. 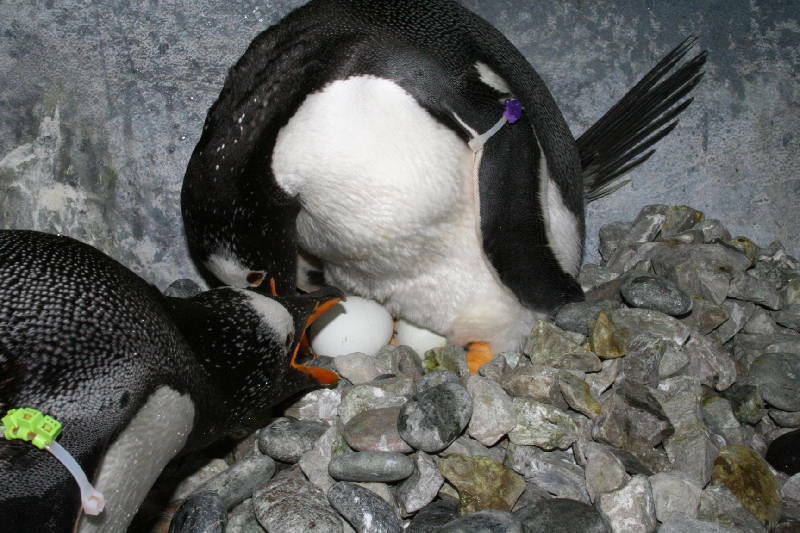 Then, last season, a 23-year-old female Gentoo named Pebbles set her sights on the aquarium's young, skillful nest builder. Every day she brought Nipper rocks — ones that pleased him obviously, for he ultimately chose her over Flower. "It's like watching a soap opera," Lee says. "I think birds are like people. They're complicated. They want a sign of one's affection or commitment." Only instead of engagement rings, penguins give rocks. The new couple did not end up having any chicks last season, but who knows what will happen this season. 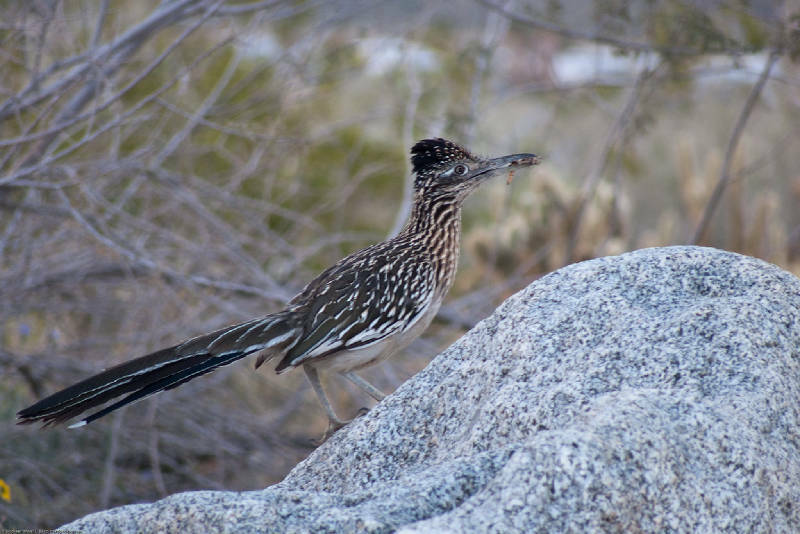 To impress his potential mate, a male roadrunner performs an elaborate display, complete with a dance and the gift of a dead animal. Penguins are not the only birds that show affection through gift-giving. Roadrunners do it, too. When attempting to impress a potential mate, the fast-running ground bird will wag its long tail, dip its head and coo, all while presenting the desired female with a dead lizard, insect or, in the case of Acme, the Chattanooga Zoo's roadrunner, a frozen mouse — which he often presents to his caretakers. As a chick, Acme was imprinted, meaning he does not know how to bond with his own species. "He sees us all as weird-looking roadrunners," says Emma DuBose, a keeper of small mammals and birds at the zoo. Frequently, DuBose says, when she enters Acme's cage, he presents her with his food. "He'll circle around me, bow and then fly up and land on my head," DuBose says. "Normally, he would fly onto the female bird to mate with her." Repeated rejection has not lessened Acme's amorous nature. In DuBose's absence, he flirts with zoo visitors, presenting his frozen mice to any strange-looking roadrunner that seems to take interest. Chimpanzees are known to give gifts of food to other primates, an act that helps establish bonds and build trust. From bonobos to orangutans to chimpanzees, there are multiple species of primates with a penchant for gift-giving. Wild bonobos, for instance, have been observed giving fruit to those not part of their group — a form of social networking, so to speak. 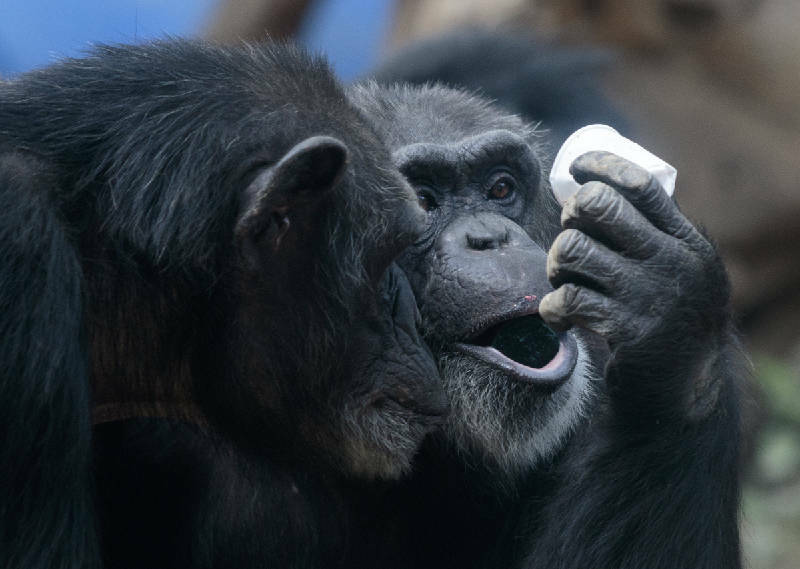 The chimpanzees at the Chattanooga Zoo, however, are more selective with their sharing. "They won't share with just anyone," says Krista O'Neill, primary chimpanzee keeper. "For chimps, it's about friendship." Shirley and Brandy, two 33-year-old chimpanzees living at the zoo, might best illustrate how intimacy influences an animal's generosity. Two years ago, the two were rescued from the same animal research laboratory in Atlanta, and have now lived together nearly all their lives. "You'll see them even sharing foods like bananas and oranges — high-value foods," says O'Neill, who has worked with the chimpanzees for a year and a half. Sometimes, she says, a chimpanzee will offer her a biscuit. But never fruit. "For birds it is more about mating," says Lacey Hickle, the zoo's assistant curator and vet technician. "But primates live in complex social structures, and so gift-giving is more about bonding and building trust." Perhaps the animal kingdom is on to something after all with the way they give — choosing gifts that are simple, practical and, most of all, meaningful.